Make it a date night to see The Wedding Singer at the Atlanta Lyric Theater, opening February 8! Love to have a good time? Then you’ll love these events listed below. Make the most of your week with these local events. For even more to do, visit our online calendar HERE. Free Mulch. Cobb EMC offers free mulch from the clearance maintenance of Cobb EMC power lines. It is available throughout the year and can be delivered when crews are in your area. More info: 678-355-3413. Feeding Time at the Chattahoochee Nature Center. Join a naturalist for an in-depth look at one of their resident animals as they are being fed. 4pm. Admission: $10/ Adult, $6/Child (3-12), $7/Senior 65+, $7/ Student (Ages 13 -18), Children 2 & under are free. Chattahoochee Nature Center, 9135 Willeo Road, Roswell. More info: 770-992-2055 or chattnaturecenter.org. Family Fun Time is for families with children of all ages. It lasts 40-50 minutes and can include books, activities, a short film, parachute play, music, and a craft. 3:30-4:15pm. Free. East Cobb Library, 4880 Lower Roswell Road, Marietta. More info: 770-509-2730. The Gritters Knitters. Do you knit, crochet, or work with yarn in anyway? If you would like to get together to craft, get inspired, and make new friends, then this group is for you. All skill levels are welcome the only requirement is your enthusiasm! Just bring your yarn and yourself. Fridays: 11am-1pm. Gritters Library, 880 Shaw Park Road, Marietta. More info: 770-528-2524. Marietta Square Farmers Market features products that are grown and produced in Georgia, including produce, plants, honey, breads, cheese and other items. Saturday 9am-12pm. Rain or shine. Now open all year. Glover Park-Marietta Square. More info: 770-499-9393 or mariettasquarefarmersmarket.net. Winter Bird Seed Sale at Chattahoochee Nature Center. Just in time for the Great Backyard Bird Count, fill your feeders with Cole’s premium bird seed and benefit the Chattahoochee Nature Center (CNC). Pre-sale orders can be placed online or at the Nature Store. Prepurchase between February 2-11 and pick up is at CNC February 16-18. Chattahoochee Nature Center, 9135 Willeo Road, Roswell. More info: 770-992-2055 or www.chattnaturecenter.org. Carole Pigott: The Power of Light. Explore oil painting scenes from the Southern and Southwestern United States and is inspired by the connectedness of visual art to creative writing. The oils will be accompanied by written reflections by author, Eudora Welty. $8. 11am-4pm. Marietta Cobb Museum Art Museum, 30 Atlanta Street SE, Marietta. More info: mariettacobbartmuseum.org. Richard Cecil: Creations in Oil and Bronze. This Atlanta based artist’s work encompasses painted portraiture, still-life, landscape and more including his bronze sculptures, where he renders human forms, wildlife, and mythological beings. $8. 11am-4pm. Marietta Cobb Museum Art Museum, 30 Atlanta Street SE, Marietta. More info: mariettacobbartmuseum.org. Cobb Executive Women Luncheon. Registration/General networking: 11am. Program: 11:15am-1pm. Members: $25 at door. Guests: $35 at door. The Georgian Club, 100 Galleria Parkway, 17th Floor, Atlanta. More info: Rebecca Chadwick at rchadwick@cobbchamber.org or cobbchamber.org. Cobb County Master Gardeners Lunch and Learn: The Productive Home Vegetable Garden. Grow delicious, healthy food in your own home garden! Learn how to set up and tend your vegetable garden with an emphasis on organic methods. Program presented by Master Gardener, garden blogger and former Extension staff member, Amy Whitney, who has more than 25 years of experience growing food in her Cobb County garden. Bring your lunch. 12-1pm. Cobb Water Lab, 660 S. Cobb Drive, Marietta. More info: 770-528-4070 or cobbmastergardeners.com. Martinis & Music. Four times a year, people gather at Marietta/Cobb Museum of Art for live music, light refreshments, great art, a cash bar, and a lot of fun. Open to the public. $10/person. Free for museum members. Regular museum admission rates do not apply for this event. 5:30-8:30pm. Marietta/Cobb Museum of Art, 30 Atlanta Street, Marietta. More info: 770-528-1444 or mariettacobbartmuseum.org. Dead Man Walking presented by The Atlanta Opera. A true story that spawned a best-selling book and an Academy Award-winning movie, Jake Heggie’s Dead Man Walking tells of Sister Helen Prejean and her time as spiritual advisor to Joseph de Rocher, a murderer on death row. $38-$134. 8pm, Sunday 3pm. Cobb Energy Performing Arts Centre, 2800 Cobb Galleria Parkway, Atlanta. More info: atlantaopera.org. Into the Woods presented by Theatre in the Square. The story follows a Baker and his wife, who wish to have a child; Cinderella, who wishes to attend the King’s Festival; and Jack, who wishes his cow would give milk. When the Baker and his wife learn that they cannot have a child because of a Witch’s curse, the two set off on a journey to break the curse. Friday: 7:30pm; Saturday: 2pm and 7pm; Sunday: 3pm Tickets: $18-$25. Theatre on the Square, 11 Whitlock Avenue NW, Marietta. More info: 770-426-4800 or theatreinthesquare.net. 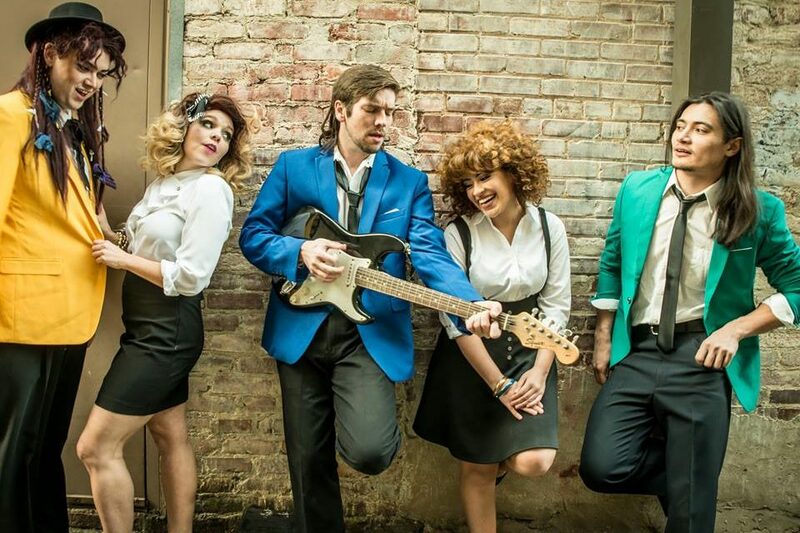 The Wedding Singer presented by Atlanta Lyric Theatre. Based on the hit Adam Sandler movie, The Wedding Singer’s sparkling new score does for the ‘80s what Hairspray did for the ‘60s. Just say yes to the most romantic musical in twenty years. Thursday-Saturday: 8pm. Sunday: 2pm. Tickets: $43-$68. The Jennie T. Anderson Theatre, 548 South Marietta Parkway, Marietta. More info: 404-377-9948 or atlantalyrictheatre.com. 39th Annual Walton Raider Chase. This 5K will be a celebration of both running and Raider Pride. Olympic style track finish, complete with live music, awards, and raffle prizes. All proceeds benefit Walton Track and Field Cross Country programs. 5K: 8am. $20-$30. Walton High School, 1590 Bill Murdock Road, Marietta. More info: waltoncinderclub.membershiptoolkit.com/raiderchase. Dancing with the Stars of Marietta. This exciting annual dance competition benefits Georgia Metropolitan Dance Theatre. Five teams of local celebrities will compete for a Mirror Ball Trophy at this fun filled event. Don’t miss the chance to cheer on your favorite team and support Georgia Metro Dance Theatre to educate, cultivate, and inspire the next generation through dance. $20-$55. 7-10pm. The Earl and Rachel Smith Strand Theatre, 117 North Park Square, Marietta. More info: 770-293-0080 or earlsmithstrand.org. Family Night Hike & Campfire at the Chattahoochee Nature Center. The winter world of CNC is one that deserves exploration in the dark. You will listen for the sounds of winter in the woods and gaze up at the stars, while enjoying the crisp air of the season. A campfire, where you can roast a marshmallow, will be waiting for you as you wrap up the evening. 7-9pm. $12/general public. $10/CNC Members. Registration required. Chattahoochee Nature Center, 9135 Willeo Road, Roswell. More info: 770-992-2055, ext. 238, or chattnaturecenter.org. Super Museum Sunday. This is an annual event coordinated by the Georgia Historical Society as part of the Georgia History Festival, commemorating the founding of Georgia. This year, there are 101 participating sites in all parts of the state. 1-4pm. Free. Bulloch Hall, 180 Bulloch Avenue, Roswell. More info: bullochhall.org. Greater Atlanta Coin Show. Many dealers in one place where you can browse, buy, sell or trade coins, currency, bullion, and other collectibles. Experienced coin dealers also provide free verbal appraisals for coins, currency and precious metals. 9am-5pm. Admission: Free. Hilton Atlanta/Marietta Hotel and Conference Center, 500 Powder Springs Street, Marietta. More info: 770-772-4359 or www.atlcoin.com. Low-Cost Pet Vaccination Clinic. Save an average of 50% off retail pricing for vaccines and supplies like flea, tick and heartworm preventative. You’ll also receive a gift card for a free pet exam at Town & Country Veterinary Clinic. Dogs must be friendly around children and other dogs. 12-3pm. Janice Overbeck Real Estate, 2249 Roswell Road, Marietta/East Cobb. More info: janiceoverbeck.com. Cobb Chamber First Monday Breakfast with U.S. Congressman Barry Loudermilk. Networking: 7am. Program: 7:30-9am. Members: $30; General Admission: $60. Cobb Galleria Centre, Two Galleria Parkway, Atlanta. More info: 770-980-2000 or info@cobbchamber.org. The Military Family Support Center On-site Sale. The sale is available to retired veterans and active duty personnel and their families who have been granted commissary privileges. This sale features grocery goods sold at cost plus a 5 percent surcharge, and features a stock assortment of about 1,000 items including fresh meat, fresh produce, chilled and frozen items. Thurs-Fri: 9am5pm; Sat. : 9am-4pm. Military Family Support Center, 1901 Terrell Mill Road, Marietta (intersection of U.S. Highway 41 and Terrell Mill Road). More info: Susan Edmonds, susan.edmonds2@deca.mil or 478-222-7618. The Cotton Club Revue presented by Theatre in the Square. The story follows a Baker and his wife, who wish to have a child; Cinderella, who wishes to attend the King’s Festival; and Jack, who wishes his cow would give milk. When the Baker and his wife learn that they cannot have a child because of a Witch’s curse, the two set off on a journey to break the curse. Thursday-Saturday: 7:30pm; Sunday: 2:30pm Tickets: $30. Theatre on the Square, 11 Whitlock Avenue NW, Marietta. More info: 770-426-4800 or theatreinthesquare.net. Get the scoop on East Cobb! Sign up today for the EAST COBBER's weekly e-newsletter.